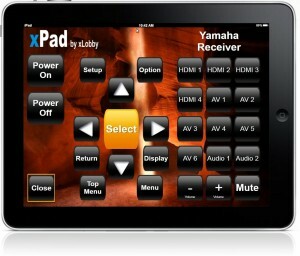 We have been busy with many new design concepts, ideas and hardware to keep moving xLobby forward. 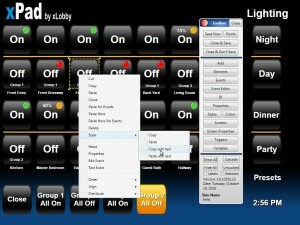 There is so much happening in our industry with regards to how people want to interact with their home theater A\V – automation systems and what devices and methods they use to control them. 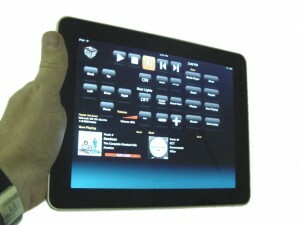 The major buzz at Cedia 2010 lately seems to be all about IPAD, Itouch, Iphone interfacing and control. The low cost and popularity of the Ipad has pushed many companies that have had pricey, proprietary hardware control platforms to reevaluate their product offerings. 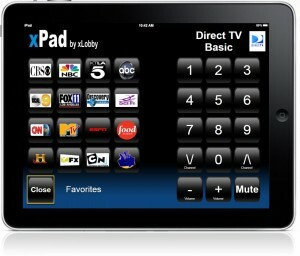 The new xPad webserver system in xlobby can run on any device that supports Internet Explorer, Mozilla, Safari. 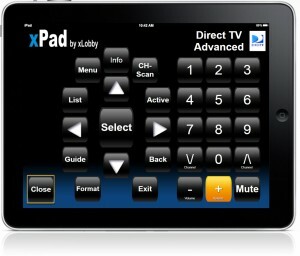 Now xLobby can just be a simple control system or a powerful media management and control system, you decide. Build your own control menus yourself without the cost of a out sourced programming service or in house specialized systems programmer. 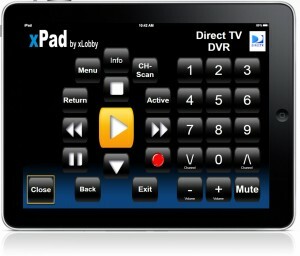 Images of xLobby IPad test menu control interface, fullscreen with 2 way feedback. 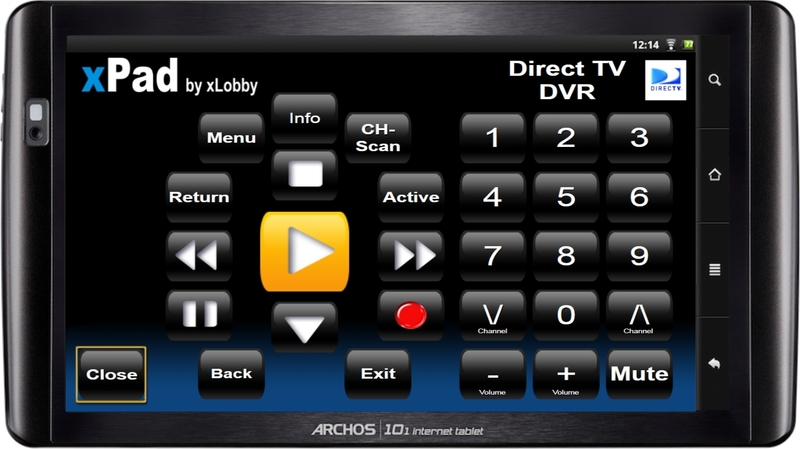 The 3 Direct TV menus are just sample testing designs and can be changed or modified to suit any users preference for controls or layout. 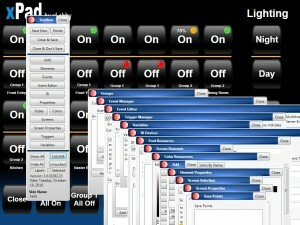 Design interfaces that work in landscape or portrait orientation. 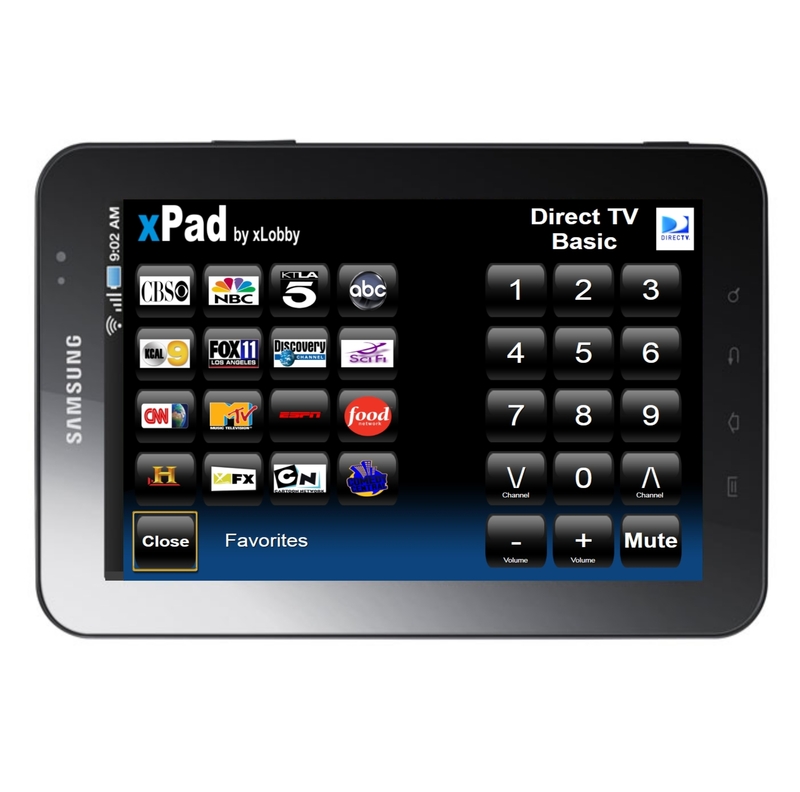 The new Samsung Galaxy Tab 7″ tablet will run the new xLobby webserver applications. 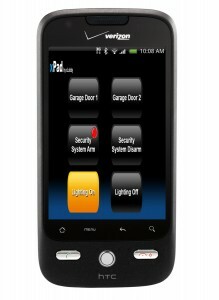 HTC Droid and other Cell phones with wi-fi browsers can easily interface with xLobby new webserver application. The next release of xLobby V3 will have some new powerful tools with ongoing improvements with updated features for creating interfaces that can be used on the Ipad, Itouch, Iphone, Droid or any other device that supports a webbrowser interface driven by the standards of internet explorer, Mozilla and Safari. These new tools and features can be applied to existing remote control comapanies like RTI, URC (Universal Remote Control) who have webbrowser based technology built into there handheld remotes and inwall touchscreen products. These new features and tools are a completely different concept then the the xLobby webserver that exists right now. The existing (Webserver) uses a method that sends static jpeg based images that are updated and controlled by sending button coordinates back to the server to update the page with a new jpeg image. This process works but has several issues of speed and also requires the screen to refresh in order for the user to see the changes. The new platform is completely converted and coded in HTML on the fly from xLobbys current skin editor, creating virtualy the same user experience as the xLobby compiled software. The first release will have some limitations and restrictions on certain advanced controls and commands until we complete all the programming and HTML coding translations. Using the new HTML5 language format will allow us to create visualy dynamic interfaces with simple tools in the existing xLobby skin editor, eliminating complex coding to the user. 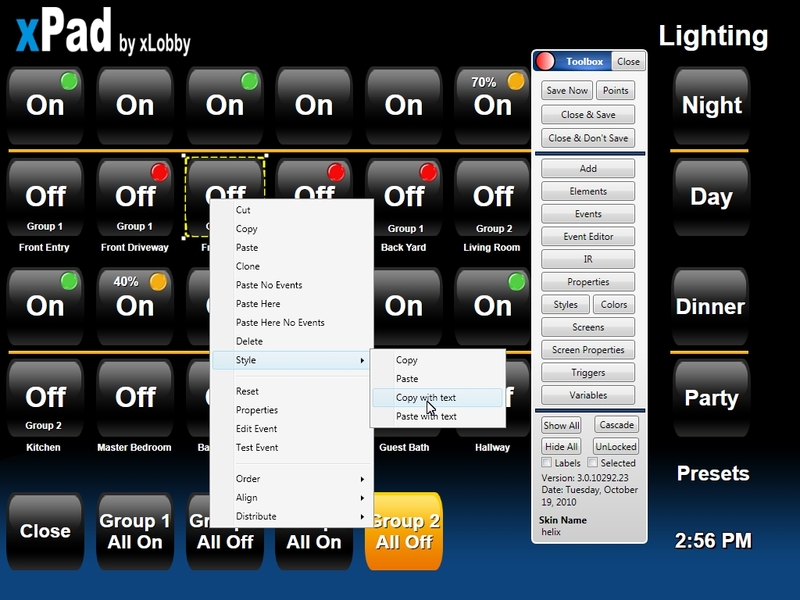 These new features and tools provide xLobby the ability to create very simple and dynamic control interfaces that can run on many devices without the needed overhead of the windows OS. 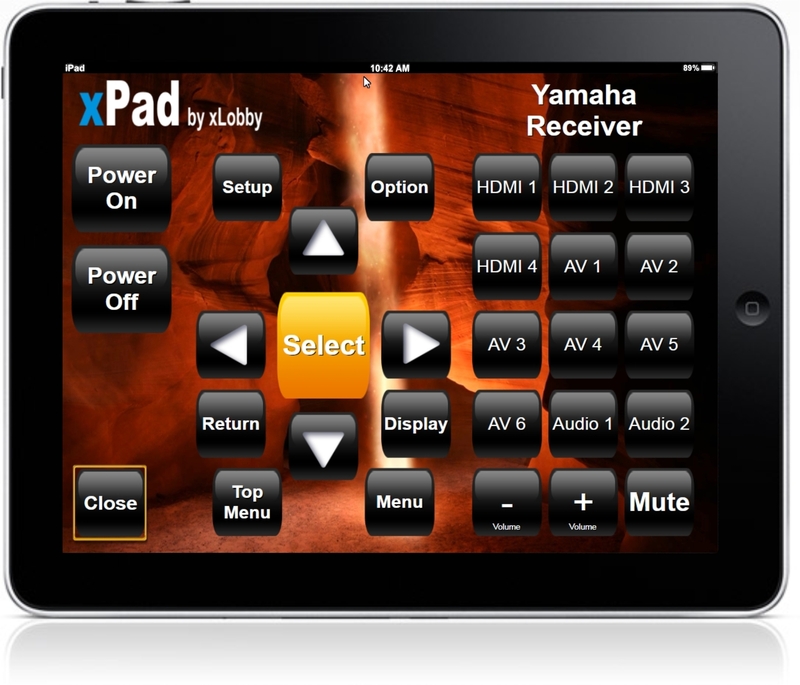 Now use xlobby V3 just to create and control IR, RS232 or IP based devices only. A few items to mention about the first inital release. 1. The menu buttons graphicly change states just like the current xLobby menus. 2. Sound feedback when buttons are pressed. 3. Realtime feedback and updates for all xLobby variables including volume, music progress time, progress bar, coverartwork, etc. 4. Constant Button touch for repeated triggering, useful for volume controls, channel up/down, lighting (Diming-Brightness) commands. 5. Automatic reconnection when out of wi-fi range with message system indicating loss of connection network connectivity. 6. 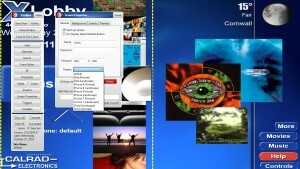 Works in Ipad webbrowser mode or fullscreen, no browser controls shown, also disables the bookmark or any other features that effect the display. 7. Easily supports multiple devices-Ipads on the same wi-fi or hard wired network at the same time providing users with the ability to be independent and in different menus. 8. Design menus in different resolutions for multiple devices all in real time using the same skin editor and tools that xLobby V3 uses. (Viewport) Feature. 9. New menu tools for seperating standard menus from webserver based menus, screenshots will be available soon. 10. 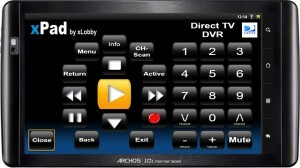 A fast interface with no screen refresh or loss of graphic quality. 12. The new display technologies from many manufactures like Samsung, LG, Panasonic and Sony are incorporating builtin webbrowsers to access online content. 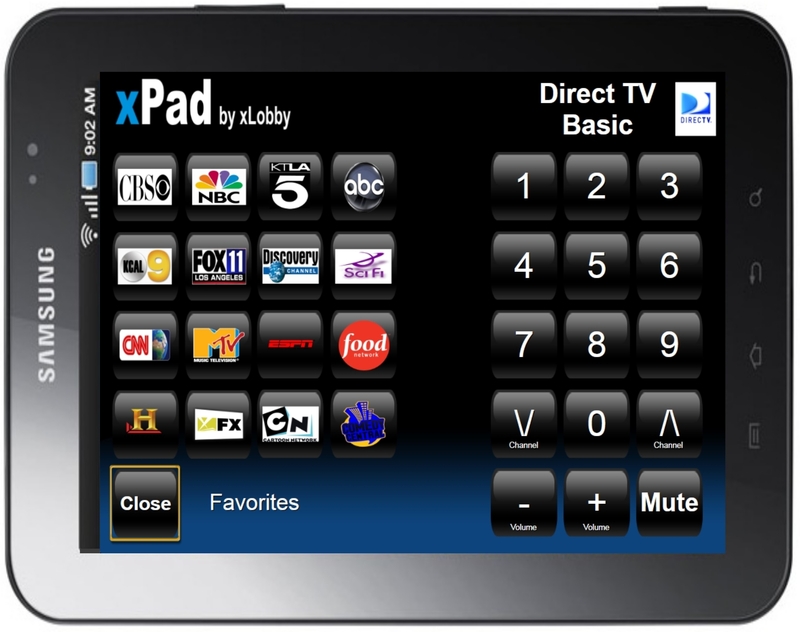 These new products will now provide a simple method for displaying the xLobby GUI directly to the display with the ability to stream music and movies without multiple PC’s or xLobby hardware. xPad Screenshot showing the skin editor with some of the new tools. The Viewport settings allow you to Zoom in and out to specific resolutions or to select the device you are designing the interface GUI for, further features will include naming and saving your own custom screen sizes. 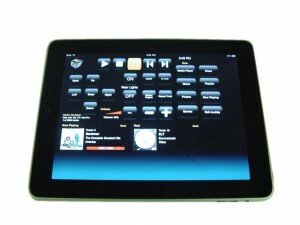 A option to show a mockup of the device with the skin inside the screen area will provide users with a realistic view of what the menu might look like when loaded. Screenshot of the xLobby skin editor showing the new viewport preset menu for designing menus for different devices. Screenshot of the skin editor with a new feature to copy a buttons style and text in one copy, paste event. 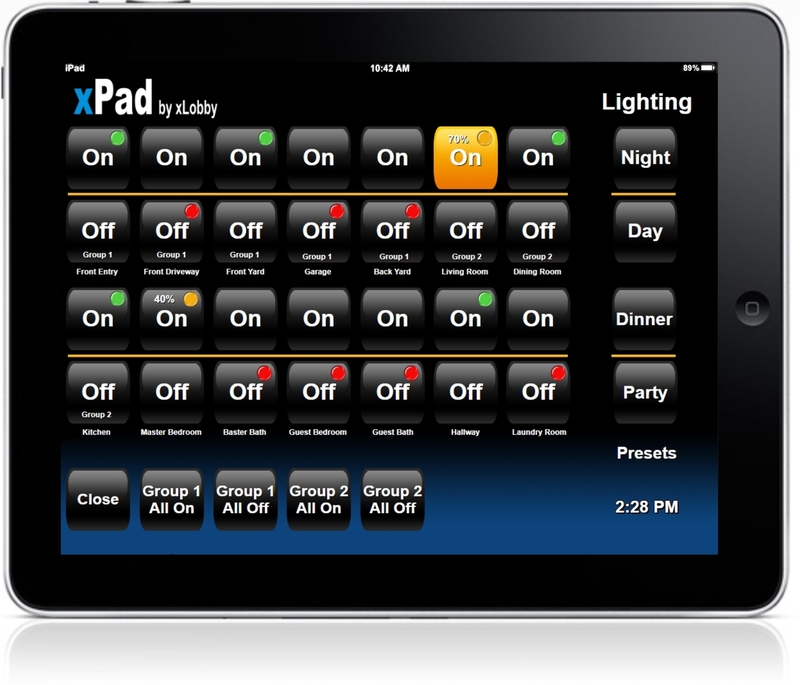 Did I mention that xLobby has one of the most powerful set of design and control tools in the industry built right into the application. The xLobby platform is now over 12 years old and under constant development. 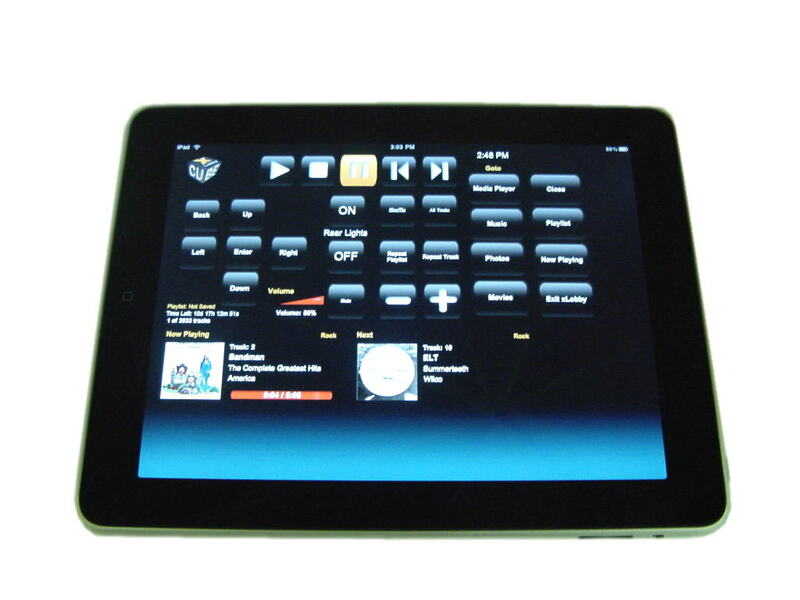 It is now possible to create any interface you want for Ipads, Iphones, Android phones and many other products. 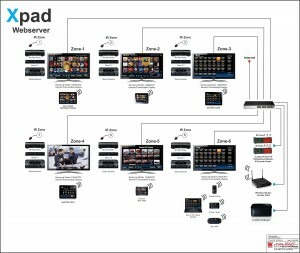 The xpad example diagram shows how using a single inexpensive xLobby piece of hardware running xLobby V3 can control 6 zones of Audio-Video products all using standard networking products and IP based IR control hardware. 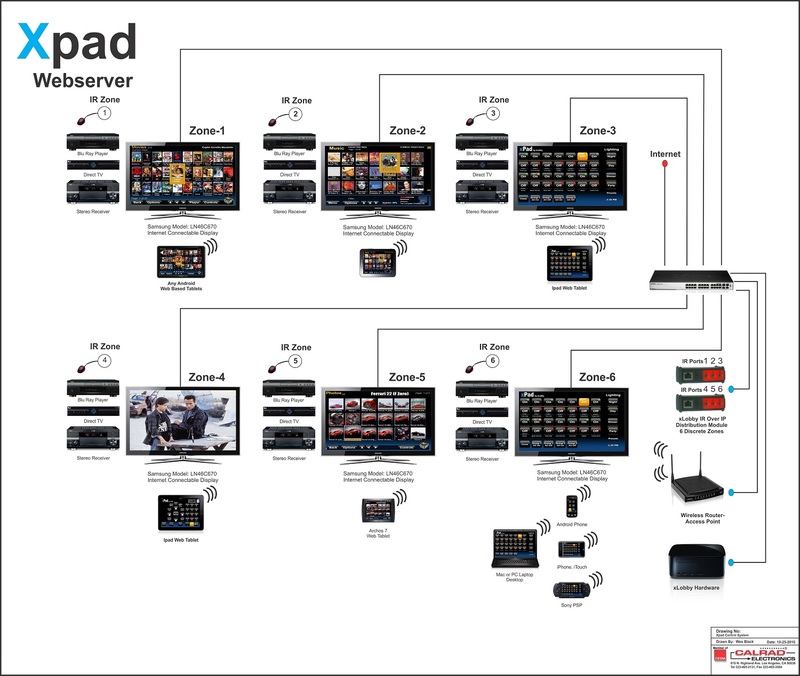 The diagram illustrates using web based products, wired or wireless to view and control xLobby or any piece of IR driven equipment, notice that all the control devices are running on different platforms and that all the devices can run at the same time and be in different menus. This diagram is a first in a series of diagrams that will show the power of xLobby leveraging any technology today for control of any device over IR, RS232, IP. 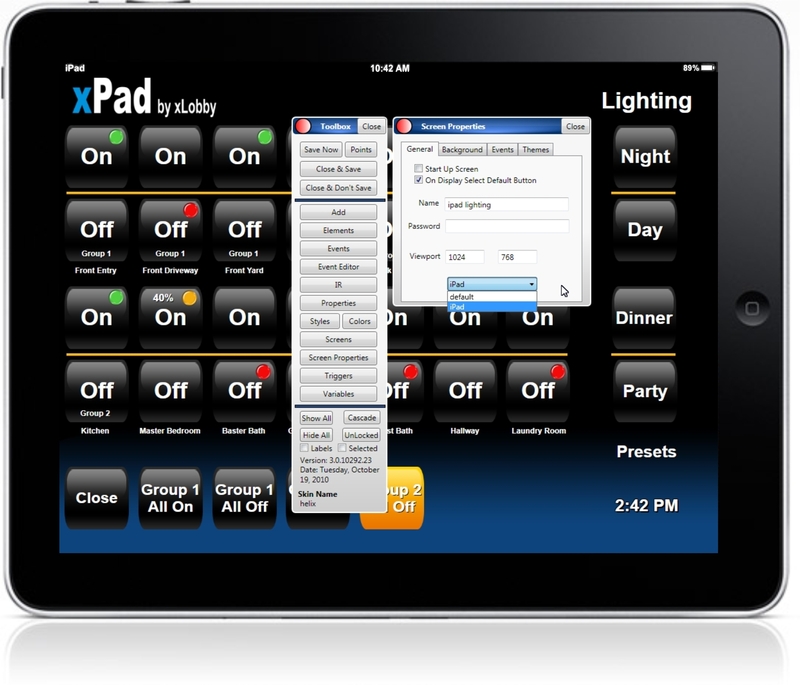 With xLobbys builtin skin editor and management tools, installations that require very simple or complex interface can be created on for individual devices. 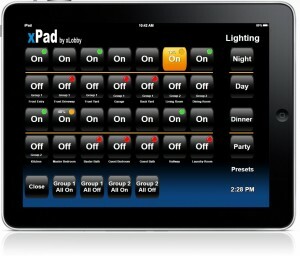 For example a Ipad can have one menu with many controls on it for whole house lighting and a Iphone could have just 4 simple on\off buttons on it for 2 zone lighting control. 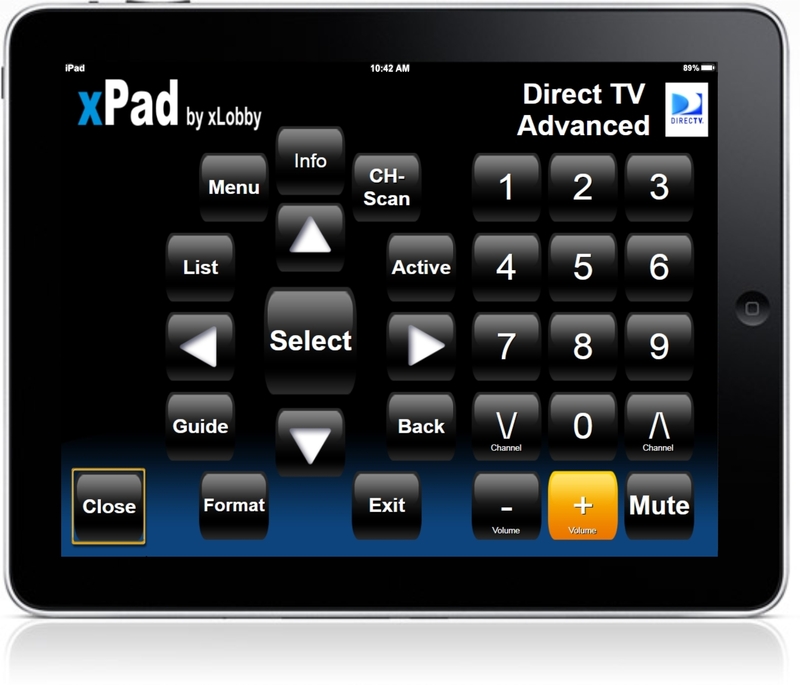 Using IP based products with xLobby users can provide a simple method of creating a inexpensive and cost effective non-proprietory scaleable media management and control system. Operate your HVAC, Lighting, Security, Multi Zoned Audio, Energy Management systems from well known cost effective products using various manufactures on multiple devices. 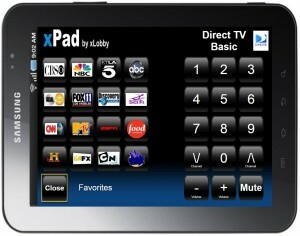 In future versions of the xPad platform it may be possible to use web based displays/Tvs like Samsung, Panasonic, Sony, LG to directly control xLobby using simple 6 button navigation controls or have a web based tablet in mimic/mirror mode directly control what you see on the display in xLobby for that room. 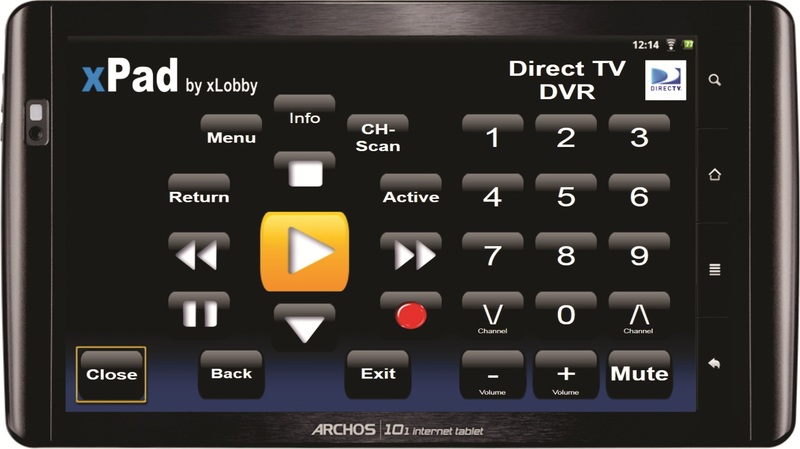 The TV display may directly render music or movie content directly from the xLobby managed hard drives or NAS storage devices. 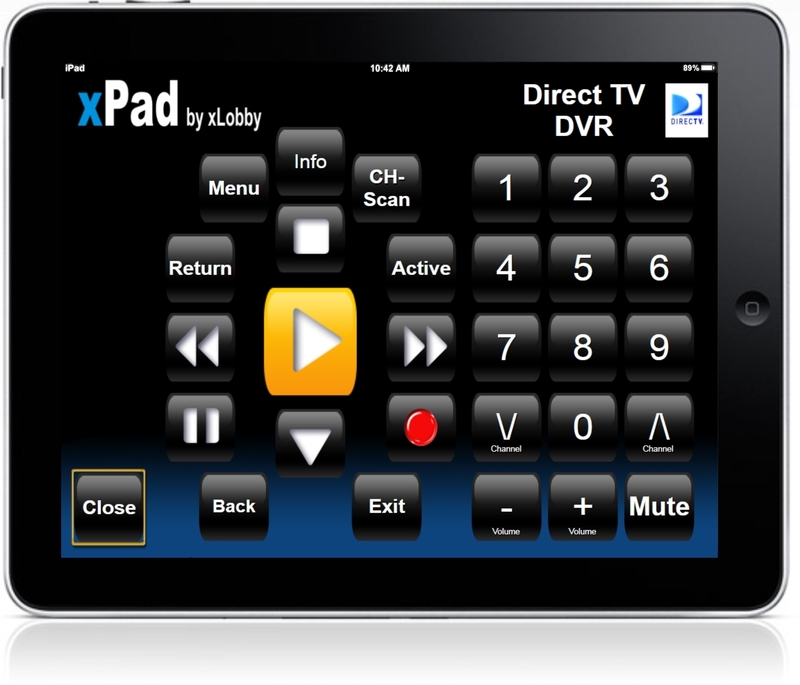 Other interesting possibilities on the xPad system is that any of the devices (Wired or wireless) can be setup to control all of the other Audio-Video systems in the house. This will be available on the first release. I will be updating this news post on a regular bassis, so check back to see new information, screenshots, diagrams and videos regarding xLobbys new dynamic webserver media delivery and control system. You are currently browsing the xlobby news blog archives for October, 2010.